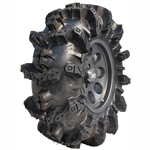 Need the right set of UTV mud tires and wheels? Our mud tire and wheel packages ensure that any UTV will be able to cruise through muddy trails, swamps and other deep mud terrains with ease. 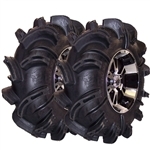 Our collection of mud tires and wheels are some of the toughest and strongest UTV tires and wheels on the market. Start shopping today and get ready to get dirty on your next adventure!